If you’ve ever been around someone who loves to cook, you’re probably already familiar with the names Shun or Wusthof. They are two of the top knife-manufacturers in the world and most professional chefs carry one or the other. These knives may be top of the line, but so is their price tag. Most knives in this elite category can cost you upwards of $150(for a single knife, if you find a good deal). Meanwhile, you can get a solid set of knives for around $30(I purchased this set 3 years ago). I also bought a Shun 8″ Chef’s knife at the same time for around $150 plus tax. But compared to my generic set, the difference in quality has been astounding. I cook on average around two times a week, so I’m not using my knife every day, but it’s amazing how much sharper this knife is. I actually feel like I’ve gotten pretty spoiled since I started using this knife and now I won’t chop with anything other than my Shun. I paid around $150 for my Shun knife two years ago and around the same time I also bought the Ginsu set of knives referred to above. The set included: an 8-inch chef’s knife, an 8-inch slicer, a 7-inch santoku knife, a 5-1/2-inch boning knife, a 5-inch utility knife, a 3-1/2-inch paring knife, and six 4-1/2-inch steak knives, plus a pair of shears. Now the only knives I really use out of that set are the steak knives and the slicer(bread knife) because I use my Shun for almost everything else. I contemplated buying the Shun for a while because like I said, you can literally buy five sets of knives for the price of one. However, I’ve been happy with my choice because the blade on my Shun is like no other. I was actually pretty nervous about using it for the first couple months because I didn’t want to cut my finger off, that’s how sharp it is. It’s hard to say if the quality of the knife is 5 times better than my knives set but it’s close. I just had my Shun sharpened for the first time and it looks and feels like a brand new knife. I still use my other set all the time but they’re getting close to the point where I may have to throw them out soon. I think it’s best to get an expensive all purpose knife like a Shun or Wusthof because you don’t need the highest quality when you’re cutting bread or slicing into a juicy steak. A Shun knife has a very thin and sharp blade, so it can’t be used to chop things like bones, avocado seeds, etc. After about 6 months of using my Shun, I noticed that it had lost a little bit of its sharpness. I could no longer cut through a ripe tomato with minimal effort so I knew it was time to get it sharpened. Here’s where I made my first mistake. I bought an electric sharpener from Shun for $30 and sharpened the knife myself. It helped a little bit but it definitely didn’t bring it back to its original state. I later talked to some experts and they told me how bad this was for my knife. Apparently, there is a whole art to sharpening that an electric sharpener will never achieve. My options were a little limited though because I was too cheap to send it in for sharpening. I had a couple chips in the blade and they charged per inch of sharpening so I think it would have come out to around $20 plus shipping both ways for sharpening. But luckily, they brought back their free sharpening service this year so I sent it in. I think the free sharpening service makes the knife a much better investment. Now that I’ve got it back and I’m using it again, it’s just like brand new. They somehow got rid of the chips in the blade and restored it to its original state. Overall, I really love my Shun knife and I think using it in combination with a cheap set of steak knives has worked well. So what type of knife or knives do you have in the kitchen? Do you think it’s worth it to get a top of the line knife and if so how do you keep it sharp? I definitely think it could be worth it if you enjoy cooking and use knives a lot. I also bet if you use it correctly it will last a lot longer than a generic knife set. I don’t know enough about knives to justify the cost but if it is something you want to spend on consciously and get a lot of enjoyment out of I think it was a great decision. Yea I know what you mean. The thing is with some of these top of the line knives, they all offer free sharpening so you really don’t need to know how to sharpen it. All you have to do is take decent care of it and send it in every year or two. I think if you are chopping/cooking more than 2-3 times a week it’s worth it. Ugh – I hate knives. We have a knife block that someone bought us after we got married, and it has maimed both of us to varying degrees. We just ordered a vegetable cutter online so I don’t have to pull out the big sharp knives nearly as often! I just found some knifes left by the previous owner in the house I moved into last week so they will do for now, but a good knife is definitely on my to buy list! You do save a lot of time too doing the job properly. Yea I think that’s the one thing people don’t realize until they buy an expensive knife. It is so much easier to chop and it really does save you time when you’re cooking. I guess if you don’t cook that often though, it doesn’t matter much. We usually buy a cheaper set of knives as we can’t justify spending that much. I see how they can be a good thing to have, but just can’t see us spending that much. My wife had some Cutco knives when we got married and they actually sent a rep out to sharpen them for us for free. Of course, we did have to listen to their pitch after they did it. Wow I’m surprised to hear that no one else has an expensive knife, I guess I’m alone on this one 🙂 This knife should last forever though so I don’t think I’ll ever have to buy another one. 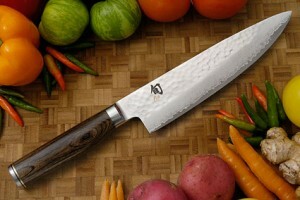 I’m looking at getting some Shun knives. 1. Did you buy any more beyond the 8″ chef knife? 2. Was it Shun that offered the sharpening service, or some other company? Hey Paul, I’m actually still using the same 8″ chef’s knife all the time! I absolutely love it, I cook 2-3 times a week and it’s perfect for that. I haven’t needed to buy any other sharp knives, I just use the cheap Ginsu set for things like a bread knife and steak knives. Shun now offers free sharpening service again, you just have to pay for shipping. I’ve only sent it in to be sharpened once in 2 years of owning it and it was like a brand new knife when I got it back, I’m also taking much better care of it this time around so it will probably be another year before I need sharpening again. I’m actually looking into the Japanese Knife Imports that another commenter mentioned. I wasn’t extremely satisfied when I was trying out the Shun and Global knives. I really want to talk to an expert on Knives, so I emailed the owner and we’re setting up a phone chat soon. Ah interesting, I really only use my knife 2-3 times max per week so for me, the Shun is perfect. There are definitely some quality knives out there though and that’s pretty cool of the owner to chat with you, let me know how it goes. I have a selection of Chroma 301 knives that are around $75-150 per blade depending on the size. 1 enormous standard chef’s knife, 2 santoku blades (one regular, one with the granton edge relief things) the bread knife, and 2 carving knives. The super long thin one that they advertise as the ham/fish slicer and the regular sized short carving knife. The long one is an essential knife for any whole bird you want to slice or making paper-thin cuts of meat of any roast. I’m terribly fond of ergonomic tools, and having the right tool for the right job. The handles of the 301 knives fit my hand very comfortably. I sharpen my knives about once a month to keep them “scary-sharp” as my partner says… she won’t even touch them. Due to allergies and a desire to not eat anything processed I cook 2-3 meals per day for my family. So sometimes I need to sharpen a bit more frequently than once a month, but it’s generally only the santoku blades as they are my go-to knives for pretty much everything except when things are large or require mincing. (Chef’s knife) Or of course breads require the bread knife. I use a 1000x stone to start and then after about 2 minutes I’ll switch to a 4000x stone for final polish. 15 minutes to let the stones soak, then 15 minutes to sharpen everything, 5 minutes to hone the stones back to flat and then 5 minutes to clean up. Wow interesting stuff, thanks so much for the detailed response. I haven’t thought about getting a whetstone since I only have the one knife but I think it might be a good investment once I get a couple more knives(and I definitely will!). I know a lot of people do it yourself with the whetstone so I’m assuming it can’t be that hard. I have a few “Norton” water stones. They aren’t that expensive. For starters you might consider a combination stone. Which is just 2 stones glued together so you have 2 different grits in one space saving brick. Nice thanks, I’ll check it out! I love my Wustofs! I actually worked as a chef in college and realized that really all a chef needs is 3 knives: 8 1/2 French, bread, and paring. I invested in Wustofs for all 3 and they’re amazing. They make cutting so much easier so that prepping is actually fun. Also, the sharper edge makes them safer, since you don’t need to come down with so much force. I didn’t know there was so much science behind cutting food with a knife. I love sharp knives and have always wanted to buy a good quality one, just don’t know where to look until now. Thanks for sharing. I like how they have the free sharpening service, but at $180 hmm, yeah.. will have to think about it. I just have normal $40 for a set of 5 knives in my kitchen. I don’t think you’ll ever be able to find one for under $100, but you can definitely find a good deal on a Shun or Wusthof for $100-$125 if you’re patient. I’ve seen some deals on Shun Chef’s knives in the past few weeks. Awesome, someone agrees with me! haha I do agree though, a quality knife can save you time and it just makes cooking so much easier and enjoyable. Buying a good quality knife can definitely be worth it in the end. If you take proper care of it, it can last your entire life. Electric sharpeners are very bad for knives. Pro knife sharpeners can do different things with knives depending on your needs. They can give a knife a little bit of bit to hold onto the object your cutting, or make it smooth. Also, honing your knife before each use can help maintain the blade. A lot of people think you need to move the knife fast to hone it, but it’s not speed and it doesn’t sharpen the blade. It’s more of an alignment thing. However, acidic foods like tomatoes and lemons will dull the blade and it will need to be sharpened by a pro. Thanks Justin. I’ve never heard that certain foods will dull the blade but I guess that makes sense. This is my first expensive knife so I’m sure I’ve made a couple mistakes already. I might get a stone to sharpen the knife in the future when I get another nice knife or two. I have 2 Shun’s, from the Fuji line. Pricey…YES. Worth it? Can’t live without them. I have an 8 inch and a paring knife, both $300 a piece. They were gifts from my husband, who said they would change my life. I cook mostly vegetarian and always whole food, so I do a lot, A LOT of prep work. He was right. Boy was he ever. The thought of sending my knife off to get sharpened weighs on me because I don’t know how I’ll function without it. If you cook a lot, a great pricey knife is worth it without a doubt. If you just dabble in the kitchen, not so much. Thanks for stopping by Jill. Though we have a few too many. If we had to do it over again I think we would just get the Santoku and the utility knife because that’s generally what we use. DH sometimes prefers the chef’s knife over the Santoku, so maybe that too. We also love our chefmate knife sharpener. I started my “addiction” with Shun knives. Since then I’ve bought two Shigefusa and one Yoshihiro. The three knives have cost me a little over $2,000. The difference between these knives and Shun is even greater than going from generic to Shun type knives, but you are looking at $300-%800+ per knife. My Shigefusa knives slice through paper like its butter. To maintain this type of edge you definitely have to learn to use a whetstone, and to use it properly otherwise the increase in quality will be lost on you. Anyway, I just thought I would introduce the “next level” of knives to the thread. For anybody that is interested in these types of knives you can check out this channel on YouTube (http://www.youtube.com/user/JKnifeImports?feature=watch). The man who does the videos is an experienced knife importer who has trained to sharpen knives from some of the top knife makers in Japan. If you watch all the videos you will learn a lot and it will definitely make an argument for moving past Shun. Thanks for the link, I’ll have to check that out. I’m still pluggin away with my Shun Chef’s knife and I love it. It seems to cut through just about everything that I need with the ease and speed that I like. As for the extravagant cost of the knives you mention, do you think they’re worth it? I only cook a few times a week at most and some of the time I’m not even doing much chopping so not sure I could justify it. Nice post. I’ve hesitated to invest in an expensive Japanese chef’s knife. I’ve got a set of Cutco’s that seem to do pretty well. But I’m very curious to work with a one sided blade to see if it feels any different. One advantage with Cutco is that you can send them in for sharpening and all you pay is shipping. And sometimes they’ll just replace the entire knife. Thanks Jason. I’m still pretty happy with my Shun, I still use it nearly every time I cook! Shun was free for a while then they started charging for sharpening and now they’re free again haha. I sent mine in a few months ago and they did a great job, it’s just like new and it still is very sharp, no need for sharpening for a while I bet. Hi – Yes, I say it’s totally worth the money to get high quality knives. It is so incredibly frustrating to use a dull knife. When we go on vacation, I actually bring a chef’s knife or Santoku and a paring knife with us. I have one Ken Onion Shun Chef’s Knife which was a gift and pretty expensive but, whoa, is that thing sharp! For sharpening, I have a Gatco Sharpening system that allows me to sharpen all my knives even with varying angles. For the Shun, I keep it at the factory angle of 16º but for my other knives I will mix it up a bit. I created a knife sharpener guide (http://thebestknifesharpenerguide.com/) that has many, many details on knives, knife sharpening, and knife sharpeners. Some of the higher end electric knife sharpeners are actually really nice. Check out the Chef’s Choice 120 or the Wusthof 3 Stage Electric Knife Sharpener. Those are top notch. Thanks Bill, definitely agree, I love my Shun Chef’s knife. Don’t know if I’d go so far as to take it on vacation with me though, definitely not in my carry-on haha. Thanks for this review! I’m looking to invest in a couple of good kitchen knives. have a set of mediocre ones at home and I see myself having to replace them soon. Good knives last forever, I hear. Having to replace mediocre knives on a regular basis will come out to be more expensive on the long run. Plus, dull knives are a huge safety hazard! Yea I’m still using my Shun ~2 years later and I’ve only sent it in once for sharpening(which was free!). It’s pretty much the only knife I use and it’s really spoiled me. I can’t even cut with regular knives anymore.. I think a good set of kitchen knives is an absolute must. People make the mistake of paying big bucks for 20 piece block sets when for the same money you can have full functionality in the kitchen with just a good chefs knife, bread knife, and paring knife. Having knives that hold an edge makes a night and day difference, even for the casual cook. Yea I like using a cheap block set(like the $20 Ginsu one) and my Shun chef’s knife. I’ve had the latter for 3+ years now and it works just as well as it did when it was new. Can’t imagine cooking/cutting without it.